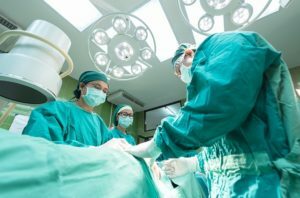 When a surgeon fails to follow the appropriate standard of care and makes a mistake that causes harm to the patient, surgical malpractice has occurred. Patients and their families have a right to file a claim to receive compensation for any injuries or damages caused by that malpractice. When a patient seeks treatment from a surgeon, the relationship is like that of entering a contract. The surgeon is expected to provide a duty of care to the patient that commensurate to his skill and knowledge. This duty of care begins with the surgical consult, remains through surgery, and continues after surgery as the patient recovers. When a breach in the duty of care causes harm, the patient has reason to pursue a medical malpractice claim. Often, surgical malpractice occurs because the surgeon failed to engage in a proper consultation with the patient before surgery. This is when the surgeon should inform the patient of the benefits of the surgery, any risks associated with the surgery, and any possible alternatives to the surgery. It is also the time when the doctor should make sure that the patient is physically capable of going through the surgery. The surgeon’s responsibility to the patient does not end once the patient is wheeled out of the operating room. He must meet with the patient to explain what went on during surgery. There must be a discussion on what the patient can and cannot do after surgery. He must monitor the patient and his care during the hospital stay. An examination should be performed before the patient is released from the hospital that includes advising the patient of any needed follow-up care.